The other pin on the web.. When talking to people about Google Maps I always mention the unique ability of Street View to provide a sense of place, the final level of zoom of Google Maps takes you beyond the abstract world of Cartography to “standing on the street corner”. Images are incredibility powerful often bringing back memories of places we may have visited. This year marks the Diamond Jubilee of Queen Elizabeth II,and to commemorate this Google has worked with Historypin to launch an interactive online gallery filled with memories of her time as Queen. The Pinning The Queen’s History project will be made up of photographic images, videos and audio clips pinned directly onto a Google Map on the dedicated Historypin site. 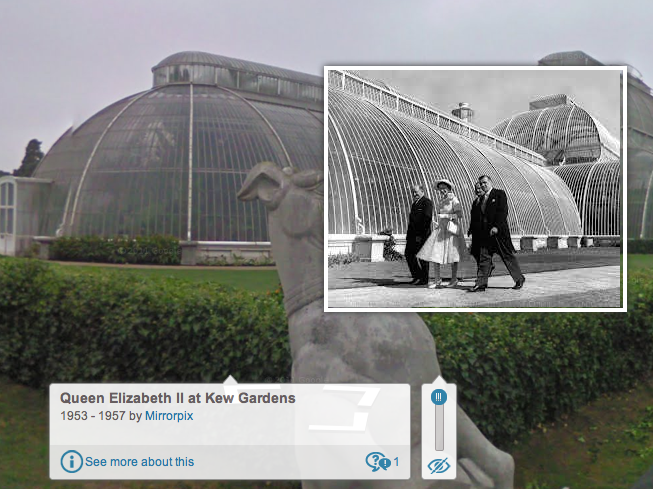 There is a crowd-sourcing element to the site as users are invited to submit photos, videos and other memories of the Queen during her many visits around the UK and the rest of the World..
Of course the most interesting images will be the ones local to your neighbourhood for me, my favourite so far is this one taken in Kew Gardens ! So go search under the bed for your shoebox of old photos and get scanning ! When talking about Google I often mention the mission statement that dates back to the earliest days of Google and has remained a constant despite all of the changes and innovation that have happened since 1998. The statement is actually still fundamental to what happens at Google and is for me a rich source of material to talk about.. for example the meaning of “useful” or “accessible” is key to understanding many of Google’s Geo products and Services. Along these lines “universally” I think has two key meaning, universal in terms of who and where the user looking for information is, and universal in respect to the very geographical concept of coverage. Since 2005 Google Maps coverage has expanded to cover (with a few exceptions) every country with both imagery and street maps. For the last 5 years Street View coverage has also expanded and as of this week the team has begun collecting Street View imagery in the wonderful African nation of Botswana. Capturing and processing Street View Imagery is a huge task far more complex that creating street maps, but you only need to ask anyone who has used Street View how useful it is.. so if is useful to a user in Guildford will it not be as useful to a user in Gaborone ? Google Maps gets the measles ? Google Maps : Dear Dr. Ed, I seem to have developed a rash or well at least I’m completely covered in spots. Dr Ed : Don’t worry Maps, it just a new way of finding geocoded images contributed by the photographers of the web. If you have looked at Streetview ( by dragging the pegman) recently outside of the existing areas of coverage you may have noted spots of streetview coverage, this is not the result of a very disorganised group of streetview car drivers, but is a way of exposing other geocoded imagery where it is available. Although the Google Streetview cars are once again driving the world bringing Street View images to many new countries in the meantime you can find suitably moderated and attributed user contributed images from Panoramio. The interesting point to ponder is as more and more geocoded images are published and indexed on the web, at what point if ever in the future will it be possible to replicate the complete coverage of Streetview with user contributed images ?